The A7V was a heavy tank introduced by Germany in 1918, during World War I. One hundred chassis were ordered in early 1917, 10 to be finished as fighting vehicles with armoured bodies, and the remainder as Überlandwagen cargo carriers. The number to be armoured was later increased to 20. They were used in action from March to October 1918, and were the only tanks produced by Germany in World War I to be used in combat. Following the appearance of the first British tanks on the Western Front, in September 1916, the German War Ministry formed a committee, under the auspices of its Allgemeines Kriegsdepartement, Abteilung 7 Verkehrswesen ("General War Department, Section 7, Transportation"), to investigate tank development. The project to design and build the first German tank was placed under the direction of Joseph Vollmer, one of Germany's foremost automobile designers. It was to weigh around 30 tons, be capable of crossing ditches up to 1.5 metres wide, have armament including cannon at the front and rear as well as several machine-guns, and reach a top speed of at least 12 km/h. The running gear was based on the American Holt tractor, copied from examples loaned by the Austrian Army. After initial plans were shared with the army in December 1916, the design was extended to be a universal chassis that could be used as a base for both a tank and unarmored Überlandwagen ("over-land vehicle") cargo carriers. The first prototype was completed by Daimler-Motoren-Gesellschaft at Berlin-Marienfelde and tested on 30 April 1917. A wooden mockup of a final version was completed in May 1917 and demonstrated in Mainz with 10 tons of ballast to simulate the weight of the armor. During final design, the rear-facing cannon was removed and the number of machine-guns was increased to six. The first pre-production A7V was produced in September 1917, followed by the first production model in October 1917. The tanks were given to Assault Tank Units 1 and 2, founded on 20 September 1917, each with five officers and 109 NCOs and soldiers. The tank's name was derived from that of its parent organization, Allgemeines Kriegsdepartement, Abteilung 7 (Verkehrswesen). In German, the tank was called Sturmpanzerwagen, (roughly "armored assault vehicle"). The A7V was 7.34 metres (24.1 ft) long, 3 metres (9.8 ft) wide, and the maximum height was 3.3 metres (11 ft). The tank had 20 mm of steel plate at the sides, 30 mm at the front and 10 mm for the roof; however, the steel was not hardened armour plate, which reduced its effectiveness. It was thick enough to stop machine-gun and rifle fire, but not larger calibre rounds. The crew officially consisted of at least 17 soldiers and one officer: commander (officer, typically a lieutenant), driver, mechanic, mechanic/signaller, 12 infantrymen (six machine gunners, six loaders), and two artillerymen (main gunner and loader). A7Vs often went into action with as many as 25 men on board. The A7V was armed with six 7.92 mm MG08 machine guns and a 5.7 cm Maxim-Nordenfelt cannon mounted at the front. * Some of these cannons were of British manufacture and had been captured in Belgium early in the war; others were captured in Russia in 1918 and appear to have included some Russian-made copies. Some A7Vs were originally built with two forward-facing machine guns instead of a 57 mm gun. Most were converted to carry a 57 mm before entering service. Number 501, Gretchen, took part in the action at St. Quentin before her 57 mm was fitted. Between 40 and 60 cartridge belts, each of 250 rounds (a total of 10,000 to 15,000 rounds), were carried; as well as 180 shells for the main gun, split 90:54:36 between canister, antitank, and explosive. These were the official figures — up to 300 rounds for the main gun were stowed for combat. Power came from two centrally mounted Daimler 4-cylinder petrol engines delivering 75 kW (101 hp) each; the A7V carried 500 litres (110 imp gal) of fuel. The top speed was about 15 kilometres per hour (9.3 mph) on roads and 5 kilometres per hour (3.1 mph) across country. The 24 wheel suspension was individually sprung—an advantage over the unsprung British tanks. Compared to that of other World War I tanks, the A7V's road speed was quite high, but the vehicle had very poor off-road capability and a high centre of gravity, which made it prone to getting stuck or overturning on steep slopes. The large overhang at the front and the low ground clearance meant that trenches or very muddy areas were impassable. The driver's view of the terrain directly in front of the tank was obscured by the vehicle's hull, which meant that there was a blind spot of about 10 metres. However, on open terrain, the A7V could be used to some success, and offered more firepower than the armoured cars that were available. The power-to-weight ratio was 5.1 kW/ton(6.8 hp/ton), trench crossing: 2.1 m (6 ft 11 in), ground clearance: 190 to 400 mm (7.5 to 15.7 in). "A German Sturmwagen 'cleans out' a French village. Based on an original drawing by Professor Anton Hoffmann." 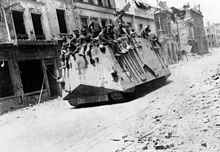 The A7V was first used in combat on 21 March 1918. Five tanks of Abteilung I under the command of Hauptmann Greiff were deployed north of the St. Quentin Canal. Three of the A7Vs suffered mechanical failures before they entered combat; the remaining pair helped stop a minor British breakthrough in the area, but otherwise saw little combat that day. 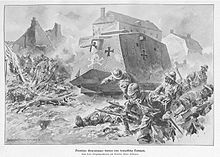 The first tank against tank combat in history took place on 24 April 1918 when three A7Vs (including chassis number 561, known as "Nixe") taking part in an attack with infantry incidentally met three Mark IVs (two female machine gun-armed tanks and one male with two 6-pounder guns) near Villers-Bretonneux. During the battle, tanks on both sides were damaged. According to the lead tank commander, Second Lieutenant Frank Mitchell, the female Mk IVs fell back after being damaged by armour-piercing bullets. They were unable to damage the A7Vs with their own machine guns. Mitchell then attacked the lead German tank, commanded by Second Lieutenant Wilhelm Biltz, with the 6-pounders of his own tank and knocked it out. He hit it three times, and killed five of the crew when they bailed out. He then went on to rout some infantry with case shot. The two remaining A7Vs in turn withdrew. As Mitchell's tank withdrew from action, seven Whippet tanks also engaged the infantry. Four of these were knocked out in the battle, and it is unclear if any of them engaged the retreating German tanks. Mitchell's tank lost a track towards the end of the battle from a mortar shell and was abandoned. The damaged A7V limped back to the German lines, but eventually broke down. Three detachments (Abteilungen) of tanks were at Villers-Bretonneux at the head of the four German divisions committed over a 4-mile front. One tank refused to start, but the 13 that saw action achieved some success, and the British recorded that their lines were broken by the tanks. However, a counter attack re-established the Allied line, by which time three A7Vs were out of action in No Man's Land or behind German lines. Nixe was badly damaged, and a German team destroyed it with explosive charges during the night of the 24th. Elfriede had overturned; it was righted and recovered from No Man's Land 3 weeks later by French troops and British tanks, and handed over to the French for examination. Mephisto lay stuck in a crater behind German lines for almost three months. After the area was taken by Australian troops, in July, the tank was towed to the rear by British tanks and, eventually, transported to Australia. In May, A7Vs were used with limited success in an attack on the French near Soissons, during the Third Battle of the Aisne. On 15 July, at Reims (during the Second Battle of the Marne), the Germans put eight A7Vs and 20 captured Mk IVs against the French lines. Although 10 of the Mk IVs were lost in this action, no A7Vs were lost. The final use in World War I of A7Vs was in a small but successful action on 11 October 1918, near Iwuy. The A7V was not considered a success, and other designs were planned by Germany. However the end of the war meant none of the other tanks in development, or planned ones, would be finished (such as the Oberschlesien and the 120-ton K-Wagen). The extremely limited production of 20 made a very minor contribution, and most of the tanks (about 50 in total) that were fielded in action by Germany in World War I were captured British Mark IV tanks (Beutepanzer). In contrast, the French had produced over 3,600 of their light Renault FT, the most numerous tank of World War I, and the British over 2,500 of their heavy Mark I to V* tanks. 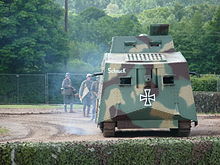 Two vehicles closely resembling the A7V, one of which was named "Hedi", were among several used by Kokampf, a Freikorps tank unit, to quell civil unrest in Berlin in 1919. They were constructed using the chassis from Überlandwagen and armed with four MG08/15 machine guns. It is not known whether the vehicles were armour-plated. There is a popular myth that several A7Vs were handed over by France to Polish forces and used during the Polish–Soviet War. However, the idea is dismissed by reliable sources, since the fate of each A7V unit that saw service in WWI is known and there is no known official record or photographic evidence of A7Vs in Polish service. The design of the A7V is featured on the tank badge of 1921, awarded to commemorate service in the German Panzer forces of 1918. Armed only with machine guns until fitted with a 57 mm cannon in late 1918.Abandoned at Sainte-Cécile (Belgium), believed scrapped in situ by Allies, 1919. After a defect of chassis 544, its structure was set to chassis 504. Damaged by friendly fire at Fremicourt, 31 August 1918. Abandoned by crew, and captured by New Zealand Division 3 days later. Displayed in London on Horse Guards Parade 1918/19. Given to the Imperial War Museum in 1919, but disposed of in 1922 with only the main gun kept. The only surviving A7V. Damaged and abandoned at Villers-Bretonneux, 24 April 1918; recovered by Australian and British troops in July; Taken via London to Brisbane, Australia, 1919. Now on permanent display at Queensland Museum. Briefly in hands of Freikorps at Lankwitz after Armistice. Scrapped in 1919. Scrapped by the Allies in 1919. 526 Possibly named Alter Fritz Cannibalized Scrapped by Germans, 1 June 1918. 527 Lotti Picture of disabled tank 527 at  Struck by artillery at Fort de la Pompelle, Reims, and abandoned by crew, on 1 June 1918. Ditched and abandoned by crew at Fremicourt, 31 August 1918; captured by New Zealand troops and displayed on Horse Guards Parade; scrapped in 1919. Disabled by French artillery at Reims, 31 May 1918; recovered by French and handed to US Army. Displayed at Aberdeen Proving Grounds Museum, USA; scrapped in 1942. 540 Heiland End of the war with troupe Scrapped by the Allies in 1919. 541 End of the war with troupe Scrapped by the Allies in 1919. Overturned and was abandoned at Villers-Bretonneux, 24 April 1918; Recovered from no man's land by British tanks 15 May, and handed over to French forces. Photographed at Saleux 26 May 1918. Displayed at Place de la Concorde in Paris in late 1918. 543 Bulle, Prinz Adalbert, Adalbert Tank was renamed twice, first around April/May 1918 and again in late May 1918. Scrapped by the Allies in 1919. Leutnant Ernst Volckheim fifth from left Lost at Iwuy, 11 October 1918. Disabled, destroyed on battlefield by Germans, 24 April 1918. Replica of "Wotan" Scrapped by the Allies in 1919; a replica A7V was built in the late 1980s, based largely on Mephisto but named "Wotan". It is now in the Deutsches Panzermuseum in Munster, Germany. 564 Prinz Oskar, Oskar End of the war with troup Scrapped by the Allies in 1919. A7V-U: (umlaufende Ketten = "tracks running all the way round"). An attempt to reproduce the all-terrain capability of the British tanks, the A7V-U was still based on the Holt chassis but had a rhomboidal hull and all-round tracks. The cab was similar to, but bigger than, that on the A7V and was mounted on top of the forward part of the hull. Two 57 mm guns were carried in sponsons similar to the British type. The prototype was built in June 1918; trials showed that it was nose-heavy and had a high centre of gravity, and the 40-ton weight caused manoeuvrability problems. On the assumption that the problems could be rectified, 20 were ordered in September 1918, the same month work on the design was halted. Drawings for two improved designs were prepared, but the war ended before any were produced. Thirty chassis were assigned for completion as Überlandwagen supply carriers, but not all were completed before the end of the war. Front armour and main gun of German A7V tank "Mephisto". 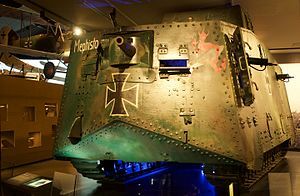 The only surviving A7V is Mephisto, which was abandoned by its crew during the Battle of Villers-Bretonneux in April 1918. It was recovered three months later by Australian and British troops, and taken to Australia in 1919 as a trophy. The vehicle stood outside the old Queensland Museum in Bowen Hills under an open-sided shelter for many years until being moved into the new Queensland Museum on Southbank in 1986. It was damaged by floodwater in 2011, and taken for restoration to the Workshops Rail Museum, North Ipswich, Queensland. After restoration it was displayed at the Australian War Memorial, Canberra, from 2015 until 2017. It has now been returned to the Queensland Museum. The cannon from A7V 504 Schnuck is on display at the Imperial War Museum North in Manchester. A running replica was built in 2009 by Bob Grundy of British Military Vehicles, Wigan, UK, a company that specialises in the restoration of old military vehicles. The replica is constructed of plywood and angle iron, using the engine, transmission and tracks from two Fordson County Crawlers – tracked agricultural vehicles – and is painted to represent A7V number 504, Schnuck. It was purchased by The Tank Museum, Bovington, in November 2012. It is on display inside the Museum, and takes part in outdoor displays alongside the Museum's replica British Mark IV that was constructed for the film War Horse. A static replica is in the Deutsches Panzermuseum in Munster. It is named Wotan, but is largely based on the surviving example, Mephisto. A mobile mock-up of an A7V appears in the East German feature film Trotz Alledem (1972), the story of Karl Liebknecht and the 1919 Spartacist uprising in Berlin. A mobile mock-up is among the vehicles at the Milovice Tankodrome in the Czech Republic. ^ a b Funk (2003), p. 135. ^ Zaloga (2006), p 7-10. ^ Tucker (2004), pp. 24–25. ^ Zaloga (2006), p. 7. ^ a b c Hundleby & Strasheim (1990), pp. 23, 34, 61, 79. ^ Forty (1995), pp. 39–47. ^ Schneider & Strasheim (1990). ^ Hundleby & Strasheim (1990), p. 150. ^ Zaloga (2006), p. 43. ^ "57 mm Maxim-Nordenfelt "Sockel" Gun". Imperial War Museum. Retrieved 10 December 2012. ^ "A7V Replica Added To Collection". The Tank Museum, Bovington. 29 November 2012. Retrieved 7 April 2013. ^ Hundleby & Strasheim (2010), p. 100. ^ "Tankodrom Milovice". Horydoly.cz. 2011. Retrieved 24 June 2016. Forty, George (1995). Tank Action from the Great War to the Gulf. Stroud, Gloucestershire: Alan Sutton Publishing Ltd. pp. 39–47. ISBN 978-0-7509-0479-7. Foss, Christopher F. (2003). The Encyclopedia of Tanks and Armoured Fighting Vehicles. Staplehurst, Kent: Spellmount. ISBN 978-1-86227-188-3. Funk, Wolfram (2003). "zur Technik des Sturmpanzers A7V (Technology of the Sturmpanzerwagen A7V)". Sturmpanzerwagen A7V : vom Urpanzer zum Kampfpanzer Leopard 2 : ein Beitrag zur Militär- und Technikgeschichte [Sturmpanzerwagen A7V: from early tanks to the Leopard 2 battle tank: a contribution to the military and technological history]. Wehrtechnik und wissenschaftliche Waffenkunde (in German). 15. Bonn: Bernard & Graefe. ISBN 978-3-76376-243-9. Hundleby, Maxwell; Strasheim, Rainer (1990). The German A7V Tank and the Captured British Mark IV Tanks of World War I. Haynes Foulis. ISBN 978-0-85429-788-7. Hundleby, Maxwell; Strasheim, Rainer (2010). Sturmpanzer A7V: First of the Panzers. Tankograd. ISBN 978-3-936519-11-2. Koch, Fred (1994). Beutepanzer im Ersten Weltkrieg [Captured tanks in the First World War] (in German). Wölfersheim-Berstadt: Podzun-Pallas-Verlag GmbH. ISBN 978-3-7909-0520-5. Schneider, Wolfgang; Strasheim, Rainer (1990). German Tanks in WWI – The A7V & Early Tank Development. West Chester, Pennsylvania: Schiffer Publications. ISBN 978-0-88740-237-1. Tucker, Spencer (2004). Tanks: An Illustrated History of Their Impact. Santa Barbara, California: ABC-CLIO. ISBN 978-1-57607-995-9. Zaloga, Steve (2006). German Panzers 1914–18. Oxford, UK: Osprey Publishing. ISBN 978-1-84176-945-5. Wikimedia Commons has media related to A7V.